Ready to get Finally Thin Forever? I understand just how overwhelmed you are by all the things you’ve tried and still aren’t getting the results you want. Weight loss is a journey. You gained weight slowly and steadily and when you lose weight, you have to do it the same way. What’s Inside the Finally Thin Forever Program? An online community of like-minded people who all are on the same journey of getting into the best health of their life! Weekly essential nutrition and weight loss education lesson complete with videos and worksheets where Tina will guide you one step at a time to get your body to drop the excess weight so you feel amazing and get your life back! Lesson 4A: Organics, Yes or No? Lesson 6: Living Your Best Life, Forever! You will get crystal clear clarity of your goals and your vision for a healthy, vibrant and free body. Free from fat, free from toxins and free from the emotions that hold you hostage. You will get a strategy and a plan of exactly what you need to do on a daily basis to get the results you are looking for. You will Master your psychology as I help you resolve your fears, doubts, and limiting beliefs so you get out of your own way. This is 97.8% of success is this inner game. PLUS! Weekly Group Coaching Calls – Every week you can join Tina for a live group coaching call to talk about your progress EVERY FRIDAY, ask questions, discuss and learn. Tina will be answering all the questions AND providing some bonus content to keep you on track toward your goals. You’ll get access to these call every week for as long as you are a member – which can be forever! How do I get access to the information? Once you join the community you will directed to a page that gives you information on next steps. You will also get an email in your inbox letting you know how to access the group on Facebook, about the lessons, handouts, important links, group coaching calls, etc. If for some reason you do not get this email you can reach out directly to me at support@tinamcdermott.com and I’ll get the information over to you asap. Sometimes spam filters block these emails so if you don’t see it, check spam and if it’s not there please reach out. When are weekly group coaching calls held? Weekly group coaching calls are held every Thursday at Noon Eastern. If I can’t make a live coaching call, how do I submit a question to Tina? If you are unable to make a group coaching call please send your questions/concerns for the week to me at support@tinamcdermott.com or post them in the Facebook group. I will address them during the call and you can catch the replay when you have time. If I miss a coaching call is there a way to get the reply? Absolutely! Coaching calls are always recorded and available almost instantly after completion. Do I have to attend every group coaching call? No. Coaching calls are there to assist you with whatever you are working on – as you need. 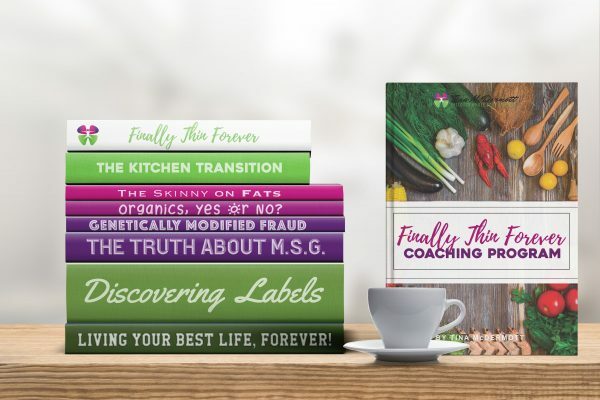 The Finally Thin Forever Online Coaching Program is typically a 6-week program. I say ‘typically’ because many people follow the weekly programming to the letter. However, if you want to take longer, you absolutely can. There is no deadline for completing the content except working through it. How long do I get access to the program content? Forever. Seriously. You can stay in the group and participate as long as you like. If I like this and want to take it to the next level, are there other ways to up my game? If I have a question/concern once I start the program, is there someone I can talk to? Absolutely. I have an open door policy about that so feel free to email me directly at support@tinamcdermott.com with anything you have on your mind about the program, movements, etc. Have a question that wasn’t covered here? Email me at support@tinamcdermott.com and I’ll respond asap! DISCLAIMER. By participating and purchasing this program you agree to the terms, conditions and other disclaimers posted. To download a copy of this document and/or review before purchase, VIEW DISCLAIMER.